This DELUXE tour is moving in more ways than one. Explore and honor three historic sites that shaped the outcome of World War II. You will visit the USS Arizona Memorial where the United States was catapulted into World War II and its fight in the Pacific began. 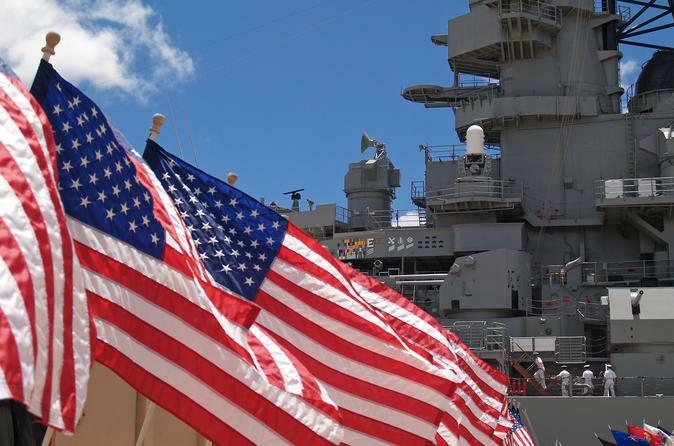 Enjoy a special Lunch in Pearl Harbor, Next, enjoy a tour of the Battleship Missouri. Knowledgeable guides provide colorful stories about the ship’s history and life at sea during a 35-minute guided tour. Later, honor the freedoms bestowed upon us by all those who bravely served our country since WWI at the National Memorial Cemetery of the Pacific at Punchbowl. Before heading back into Waikiki, you will drive through historic Honolulu to see Hawaii State Capitol and Honolulu City Hall, `Iolani Palace, King Kamehameha Statue, and Kawaiaha`o Church.